My husband told me the other day, we eat far less salad. That’s true, I eat a good amount of vegetable everyday, but more in a Chinese way. Those typical boiled, steamed or fried vegetables. But when I cook a Western dinner, I seldom consider a salad dish, maybe too focusing on the main dish, and forget about the side dish. So, for tonight I am thinking about a salad to start with, and see what to go best with the salad. My husband always loves cucumber salad with sour sauce or dressing, I saw this potato salad with yogurt and dill sauce at one of the cooking show. Thinking to do the same kind of sauce with a cucumber salad. What is the best to go with this salad? Instead of salmon, let’s see what kind of fish I can get at the supermarket. Eventually, I’ve got the catfish fillet and a prawn for each of us, should be good enough to go with the salad. Let’s get the salad prepared, so that I can get it chilled in the fringe for a while to keep it cooler before serving. I would like to have a little bit of potatoes in the salad, but not a lot, as I would like to keep the cucumber as the major ingredients. I started with cooking the potatoes into boiling water, part of it for the salad, part of it for our doggies for their usual Sunday dinner with salmon. When the potatoes are done, let them sit aside and reduce the heat. On the other hand, let’s get the rest of the salad prepared. Chop half of an onion in really thin slices, chop cucumber into thin slides, and some romaine lettuce. Put all of them into a big salad bowl, mix them well together and put the bowl into the fringe. You can add the potatoes back in when they are not hot any more. Let the salad chill until it’s time to serve. You can also get the salad dressing ready, and chill it in the fringe as well. Open the Greek yogurt and pour them into a bowl, season with some salt and pepper, add white vinegar and then mix them well together. As I don’t like too sour, I prefer to add some honey so balance out the taste a bit. It’s up to you to add honey or not. The key of this source is dill, finely chop a handful of dill, and mix them with the sauce. Let the salad dressing sit in the fringe, you can decide to serve the salad with the dressing already add in, or serve it separately. I tend to serve it separately, because we do have a different preference on the amount of dressing that we like to add into our salad. Time to prepare the fish and prawn. Add a bit of corn flour on the fish for both side in the beginning, to make sure we will keep it nicer together when frying them. Season both the fish and prawn with salt, pepper, ground coriander, paprika and parsley on both side. Heat up the pan with olive oil, fry the fish and prawn and add a bit of garlic and red chili for the flavour. Make sure one side is already done before flipping the fish, and watch out the prawn because the cooking time should be a lot faster than the fish. When one side of the prawn turned red, just flip it and remove them from the pan when both side turned red. After flipping the fish, add some chopped tomatoes and spring onion on top of the fish. 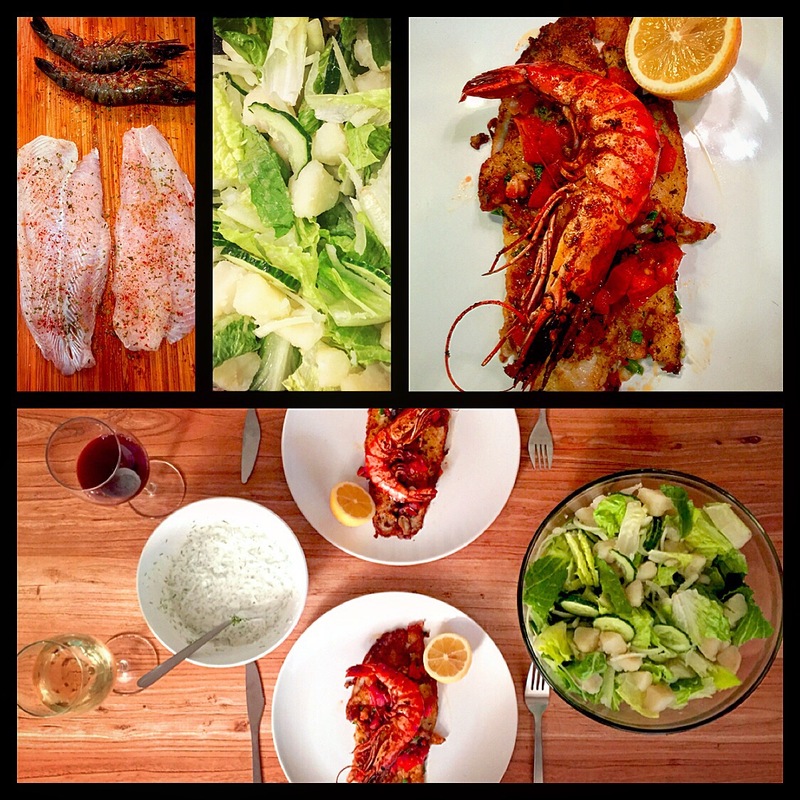 Serve the fish when it’s done, together with the prawn as a seafood plate and have the salad on the side.